Last year, I cooked a traditional American Thanksgiving for friends, complete with stuffed turkey and cranberries, and of course pumpkin pie. I’m doing Thanksgiving on a very small scale this year, using local ingredients and giving the feast a decidedly Italian flair. I’ll serve a pumpkin pasta dish. When I wrote about pumpkins a couple of weeks ago, Ren left a recipe in the comments. I made it, and it was far too much for me, so I created something new with the leftovers. It was good enough to make again. I cooked together equal parts of onion and pumpkin. You could use canned pumpkin, but you’d need to cook the onions for a long time before adding the pumpkin so they’d be soft. In another frying pan, I cooked lean sausage in a bit of olive oil with a pinch of red pepper. When the sausage was done, I combined it with the pumpkin-onion mixture. I added a grating of nutmeg and fresh parmesan. This is already waiting in the fridge. Tomorrow, I’ll cook the pasta. 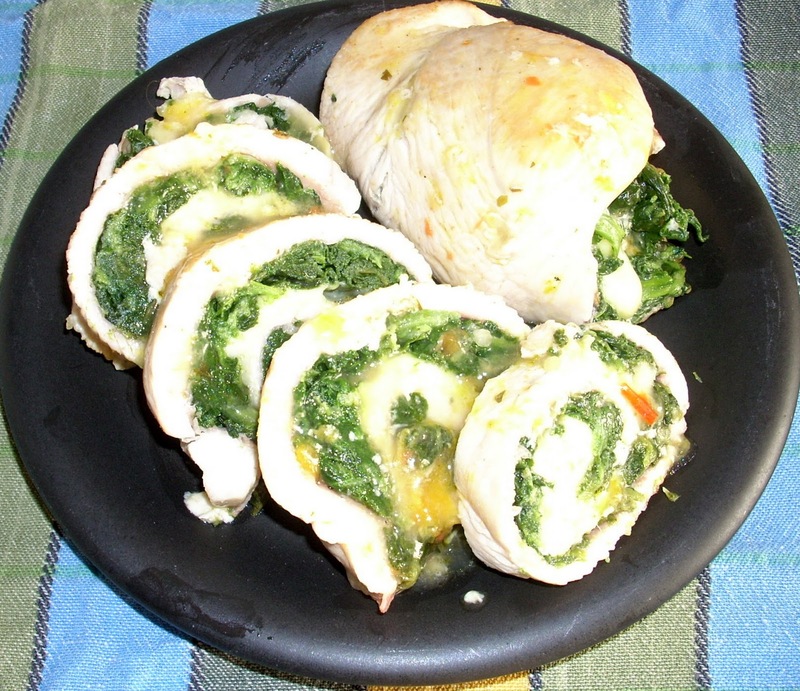 My main course is Involtini di Tachino (Turkey Rollups). To make these, I will take turkey breast slices, top each with prosciutto, chopped spinach with a grating of nutmeg, and mozzarella. I’ll rolled them up and fasten with toothpicks or kitchen twine. Then I’ll brown them on all sides in a bit of olive oil. When they’re all good and brown, I’ll add a bit of white wine and braise for about twenty-five minutes. When done (and I’ll check with an instant meat thermometer to make sure they are done. ), I’ll set them aside to rest while I finish everything else. Before serving, I’ll slice the rollups to make pinwheels. My main veggie is Brussels sprouts with chestnuts. I’ve already washed and trimmed the sprouts, and Thursday morning I’ll pick up chestnuts from a chestnut roaster plying his wares on the street. That’s the lazy woman’s way out on a busy day, and since it isn’t a holiday here, everything else is business as usual. I’ll steam the sprouts a little ahead and plunge them in ice water to maintain the color. At serving time, I’ll melt a little butter and toss the sprouts and peeled chestnuts together. I’ve made a compote of dried cranberries and oranges that’s tangy and sweet--just the right foil for the turkey. When I’m out buying the chestnuts, I’ll drop by the bakery for some crusty bread. I’ll pour a nice white wine from the Castelli and finish off with a cup of espresso and apple pie. A great sounding menu, Patricia! Thanks for sharing your Roman-American holiday table with us. Thanks, Kris. Have a great Thanksgiving. Oh, my. I'm drooling all over the place. We'll have the 'traditional' turkey dinner tonight, but we are definitely going to have the to try your Turkey Rollups. Thank you. And I am thankful for you and Wednesdays when I get your column. They are very easy, and you can do them with any meat, chicken, or even fish fillets. Just vary what you put in them. The cheese acts as a glue that helps them hold together.